The strange thing is that it is only happening with that specific e-mail address. What does it mean, and why it is happening? It means exactly what it says: the email you sent hasn't been delivered yet – it's delayed. The mail system will continue to attempt to deliver the email. Eventually, it'll either be delivered, or you'll get a fatal error message. Seriously, there are many, many reasons a particular email could be delayed. If that's a problem for you, you may be thinking about email the wrong way. Continue Reading: Why am I getting a delay notification on an email I sent? On your recommendation I recently purchased an external drive to use as a place to put my backups. I was surprised to find that it came with free backup software included. Why wouldn't I just use that instead of downloading or even purchasing something else? I get this question a lot, so you're most certainly not alone in wondering. Here's my take on the situation: I don't know what free backup software came with your drive. Continue Reading: Can I use the free backup software that came with my external drive? The Windows 10 set-up and upgrade process really, really encourages you to associate your computer with a "Microsoft account", and use it to sign in to the computer from then on. Many people find this near-requirement inconvenient, and even a potential invasion of privacy. They would prefer, instead, to continue to use a local machine account for signing in. While it's difficult, after the fact, to disassociate the computer from a Microsoft account, it turns out it's fairly easy to return your sign-in to a more familiar "local machine account". Continue Reading: How do I switch back to a local account sign-in for Windows 10? 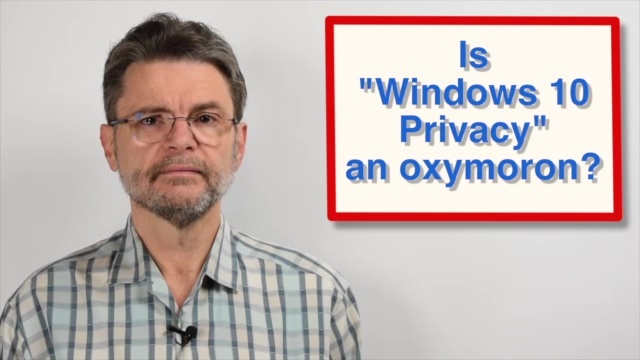 Continue Reading: Is "Windows 10 Privacy" an Oxymoron? My turn for a question for you! There are several tools on line for getting information on IP addresses and Domain names, like ping.eu or various skype resolve or other ping resolve sites, but none will give out a users name or address people. It takes the legal system to help you get that information. Leo, thank you for your hard work and time in all matters you discuss. If you tell somebody your network password, they can share it as they wish. If you type your network password into somebody's computer, they can very easily view that password and then share it as they wish. Does Wi-Fi Sense really make things less secure? It makes it accidentally less secure. If your guest proactively shares the password - yep, that's not secure. However, if your friend has no ill intent at all, he might very well accidentally share your password without knowing it if he doesn't pay attention when connecting to your network. I believe the scope of the share is also larger in this case - all his friends would have access to it if the feature is enabled. How should I back up my computer before an operating system upgrade?